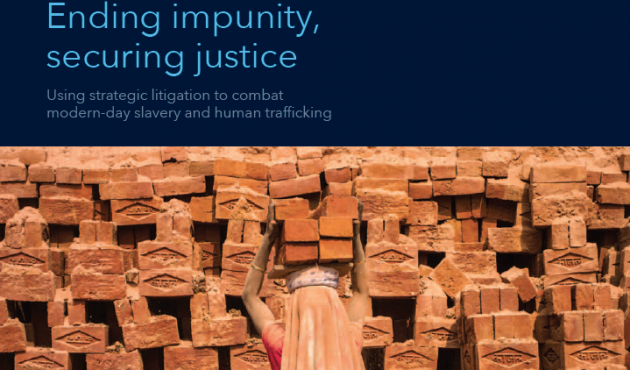 “Ending Impunity, Securing Justice: Using Strategic Litigation to Combat Modern-Day Slavery and Human Trafficking,” calls for the use of strategic litigation to combat modern slavery and provides a roadmap to create an international strategic litigation network to punish and deter human traffickers. The report, jointly published by the Human Trafficking Pro Bono Legal Center and the Freedom Fund, draws on insights gleaned at a convening of leading human rights lawyers, advocates, and litigators from around the world. The meeting, held in London in May 2015, focused on lessons learned from successful human trafficking litigation. The experts who attended the meeting expressed a commitment to eradicate human trafficking and modern slavery in global supply chains.